The NYC Department of Design & Construction has appointed Margaret Castillo to the full-time position as its first-ever Chief Architect, effective start of May. 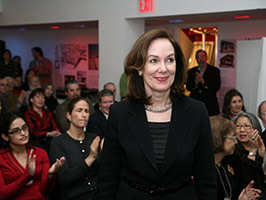 A Principal of Helpern Architects since 2000 but not an equity owner, Margaret has recently been involved with such projects as the renovation of the Nave of Sterling Memorial Library at Yale, the interiors for an 290-key hotel near Times Square, and an addition to Fort Washington Collegiate Church in upper Manhattan. Margaret’s service to the American Institute of Architects in New York City and New York State has been unflagging, and she is President-Elect of AIA NYS. Certainly, she will be able to pursue her advocacy and interest in sustainability in her new position. We wish her all the best as she participates in the City’s new capital improvements.